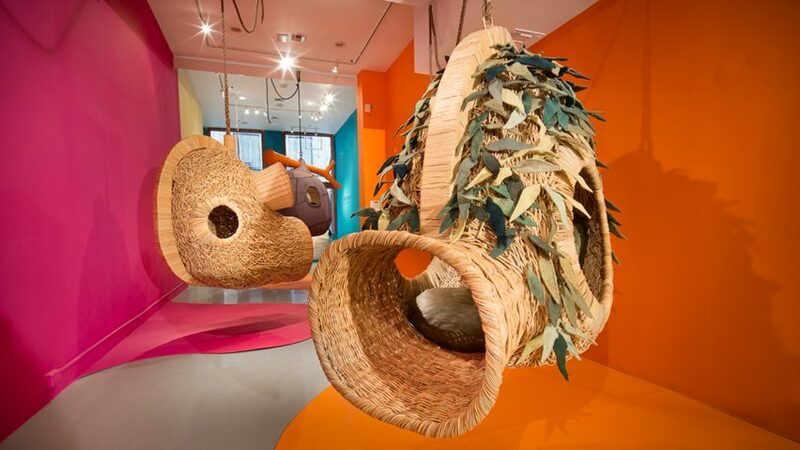 South African designer Porky Hefer presents a collection of creature-like woven seating nooks as part of a solo show in New York. Hung from the ceilings by ropes, the "nests" have cushioned interiors that create sheltered spaces for relaxing or sleeping. "Each piece is meant to be inhabited like a hermit inhabits shells," said Hefer, who is represented by Cape Town's Southern Guild gallery. The designs are all handmade in South Africa using local materials and craft techniques. The majority are woven using flexible plants stalks that wrap around steel frames, while some are covered with leathery skins. Other elements, like dried grasses, fabric leaves and rattan panels, are added for extra decoration. Large openings in the rounded structures are used to clamber inside, but also create the impression of eyes and mouths, so the nests take on animalistic qualities. This is similar to Hefer's earlier works that are based on different creatures, including a chair shaped like a killer whale that he exhibited at Design Miami 2015. Under the alias Animal Farm, the designer has also previously created a similar woven nest that hangs from a tree, as well as a wooden light that can only be used with an energy-saving bulb. His new pieces are currently on display in the Heart of Lightness exhibition, which opened yesterday at the R & Company gallery in Manhattan. The name of the show plays on the title of British-Polish novelist Joseph Conrad's 1889 book Heart of Darkness, about a journey up the Congo River. "The title of the exhibition tackles the troubling connotations and perceptions addressed by Joseph Conrad's classic," said the gallery. "Hefer is perturbed by the way colonialism perpetuated stereotypes that still exist today, which further preserve the overly broad classifications of Africa." Through his work, Hefer encourages users to reconnect with their senses, embrace instinctive reactions and become more playful. "Porky creates immersive environments that allow people to escape into a different world," said R & Company cofounder Zesty Meyers. "They're beautifully made and seemingly weightless objects that make people thinking about installation, performance and design in a new way." Meyers set up the gallery in Manhattan's Tribeca district, formerly known as R 20th Century, with Evan Snyderman in 1997. Heart of Lightness is on show at the space until 23 February 2016.